​What ​home remodeling ​info are you looking for? ​Next - ​​How Much ​Remod​el Can ​I Afford? 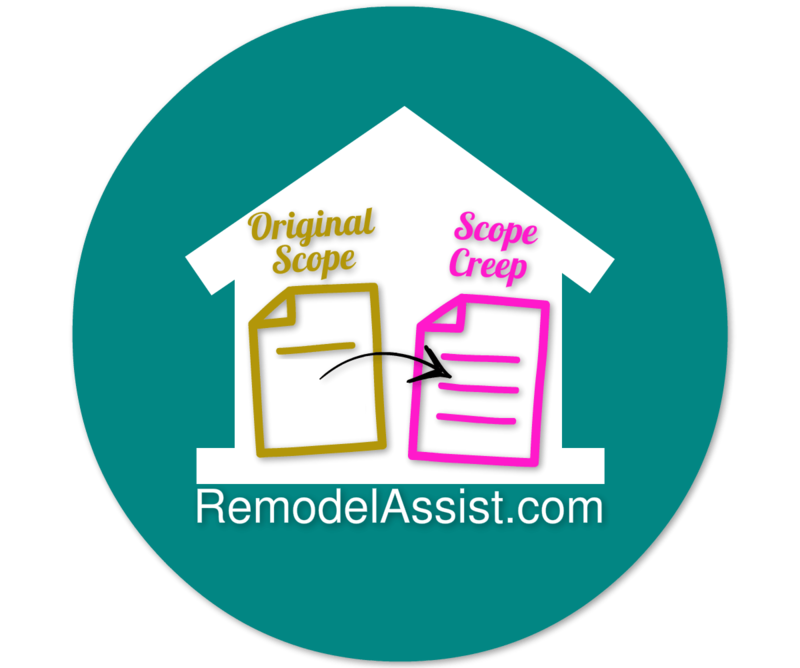 Scope creep can derail your home renovation project. Find out what it is​, as well as how to minimize it. It can be very tempting to add things along the way in your home remodeling project.​ Beware that "project scope creep" can derail your projected costs AND extend your completion date. ​Homeowners are usually excited with the prospect of living in a newly remodeled house that looks better, feels more comfortable, and has those new features you've been wanting. But, one of the fastest ways to derail your home renovation project's cost projection & extend the completion date ​is to inject "project scope creep". Wait - what in the world is that? "In home remodeling, Project Scope Creep is the addition of one or more tasks to the already-set home design plans." "Project Scope Creep is the addition of one or more tasks to the already-set home design plans." ​While the results of an extensive remodeling plan can be good, the process is not always smooth. The truth is that house remodeling is not as straightforward as it might seem on paper, especially if you go through the design plans without paying close attention to the details. Naturally, the design plan defines the remodeling project's scope. In other words, it details the specific structural changes & updates that are planned. Of course, your local General Contractor uses the plans to assess the work to be accomplished - and provides you with a formal quote. Naturally, the design plan defines the remodeling project's scope. In other words, it details the specific structural changes & updates that are planned. Of course, the General Contractor uses the plans to assess the work to be accomplished - and provides you with a formal quote. ​Things are always bound to change during the remodeling process, and it is good to be prepared for potential scenarios to help keep your stress levels low during a full home remodel. It's vital to stay positive throughout the process - as some situations are inevitable. Tip - I've heard from multiple General Contractors that homeowners typically end up spending 25% more on a home remodel project than they had expected to. On my home renovation, we shot well past 25%. This is where stress can start setting in. Such changes can be avoided if the designs and planning phases are thoroughly analyzed to help prevent surprises when the work begins. If these two steps are completed diligently, chances of having any last minute changes are significantly reduced. This is where stress can start setting in. Such changes can be avoided if the designs and planning phases are thoroughlyt analyzed to prevent any surprises when the work begins. If these two steps are completed diligently, chances of having any last minute changes are significantly reduced. Unfortunately, the idea of moving up is currently under threat due to the recent economic downturn and massive slump in home prices. Today, the decision to sell your property and trade up is no longer as clear cut as it once was. Homeowners are now left wondering whether to stay or go. Resist the temptation to add things to the project along the way - unless they are clearly necessary. Example Of A "Clearly Necessary" Scope Change - On my full home renovation project, it turns out that the concrete slab foundation that was poured in the 1950's was actually out-of-level by 2-3 inches from one end of the house to the other end. With the out-of-level situation - and the additional square footage to be added, in the middle of the house, I was going to end-up with a small step-down into my hallway bathroom and a noticeable downward slope in a couple of rooms. The fix was a $10K "over-pour" of specially formulated concrete to bring everything to level. It was unexpected, and neither the Architect or the General Contractor could have detected the issue before my house had gone through significant demolition. And, at least for me, it was absolutely necessary to do. But, in general, once a specific design is set, resist the temptation to add new features. If the changes must be made, analyze the cost vs. benefit and see whether it is a must for you to initiate a change order. Delaying the completion date of a remodeling plan typically has a negative ripple effect on everything associated with the work from that point onward. First, it will force you to pay more for the changes. And, second, it can easily extend the completion date of your project. Naturally, if you're living in temporary accommodations, that also means that you'll be paying more for housing than you would have had to. ​Much of this can be avoided by taking an adequate amount of time on the planning and design phase. Some common changes that people implement in a remodeling project include deciding to remodel a part of the house that was not initially planned for. This is common since some people initially plan to remodel, say, the ​family room and kitchen - then later feel that the bathrooms ​now look odd - and need to be remodeled, too. ​More Scope Creep From My Home Remodel - ​The two existing bathrooms in my house had been updated just before I bought the house. Because of that, we did not plan to update the bathrooms during the full home remodeling project. But, as progress was made on surrounding areas, the bathrooms started looking quite dated. From the Bathroom Remodeling Cost calculator, we were looking at adding somewhere in the ballpark of $13k of additional cost - for each bathroom. The other common change is when people settle on a design that looks good on paper - then realize that it's not the best fit for their home when the work is about to be completed. This forces them to settle for other designs that end-up taking more time and more money. Some designs might also look practical on paper but when it comes to the implementation, you realize that they are not really applicable for your desires. This is a common problem when the planning and design phase is done quickly or possibly haphazardly with insufficient attention to detail. Such project timeline delays can be very costly, especially if the remodeling project at stake is quite massive. However, much of this ​can be avoided if the initial stages of the remodeling plan are done carefully. The Internet is an excellent source of information and homeowners can simply visit a home remodeling ​idea TV show websites that specialize in remodeling projects. With these helpful websites, you can get all the information they need before deciding to renovate their homes. A​ great way of understanding the whole process is by checking out the houses that have been remodeled and checking out any available before & after images. It's also beneficial to look at any available remodeling blueprints (if they show them) and see how they were implemented eventually. Smart General Contractors that you're interested in will have periodic Open Houses to showcase their work. In these Open Houses, you'll see a number of nice features that have been incorporated into the final design that you may not have thought of. Check with your Contractor to see when their next Open House is, and show up to take notes. Find houses in your general area that are similar to yours and get ideas of how your remodeled house could look. If you can chat with the homeowner, you may want to ask them about their remodel experience - and see if they'll let you take a peek inside. You also may want to ask them about the Contractor they used, too. Your friends and colleagues are also a good source of information. ​An important thing to consider is the​ particular "design & build" contractor (or General Contractor) you select to conduct the home remodeling job for you. This can be a significant determinant of whether you meet these hiccups along the way or not. A reliable company will advise you right from the beginning - and gently correct you whenever you try to make any adjustments that will turn out sour later on in terms of additional costs and/or delayed project completion date. Cut back on the stress of organizing, planning, and designing your home remodeling project, and let the experts handle it for you. This way, the responsibility is shifted to them, and it can serve to help keep your home renovation project from getting derailed by project scope creep. It is easy to tell when you need a new configuration or additional space. The question is in how best you can achieve it. Remodeling and renovation are both used to accomplish the objective and each can be effective and satisfying if you do it will all the knowledge that you glean here. Making the right decision will reduce your stress and ensure many years of good living for you and your family.